DB Sports Tours are the market leader in Europe for youth soccer trips and cup competitions, and today we are proud to promote the world’s largest youth soccer tournament, the Gothia Cup, set to take place next in July 2019 in Gothenburg, Sweden. 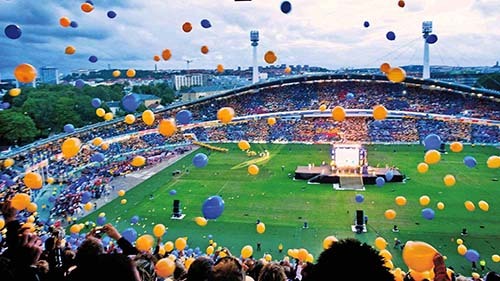 Formed in 1975 by the professional Swedish football club BK Hacken, the Gothia Cup has grown immensely in recent years. The Gothia Cup now attracts over 1,600 teams, taking part from over 80 nations each year. With such a wide variety of teams taking part the Gothia Cup is also the most diverse and global youth soccer tournament. The extensive nature of the Gothia Cup is one to behold; over 4,500 games will be played throughout the week of football, on 110 different football pitches. While there are only eight full-time staff working year-round on the Gothia Cup, over 2,200 staff work during the week of play to ensure everything runs smoothly. We are hoping for one group to travel to the Gothia Cup next July (14 – 21), taking part in this truly global soccer tournament. Each team will be guaranteed a minimum of four games to be played, with more dependent on progression to the latter stages of the tournament. The age groups provided for in the Gothia Cup is vast and includes both boys’ and girls’ teams. For boys there will be seven age groups involved: U-11, U-12, U-13, U-14, U-15, U-16 and U-18. For girls’ teams there will also be the same seven age groups catered for: U-11, U-12, U-13, U-14, U-15, U-16 and U-18. Your total package for this soccer trip to Gothenburg for the Gothia Cup will include seven night’s accommodation on a board basis – meaning only breakfast will be provided. Furthermore, your package will include all necessary transfers using The Gothia Line. You will be provided with admission to the opening and closing ceremonies of the Gothia Cup, as well as admission to several interesting museums using your Gothia Card, which will be provided. All players will be given a team photograph to remember this soccer trip of a lifetime. Finally, it should also be noted that all competitors aged between 11-19 will be admitted into the Gothia Heden Centre – the heart of the tournament, with many helpful amenities on site here. If you are interested in delving into the world’s largest and most diverse youth soccer tournament then don’t hesitate to contact our sales representatives’ todays by clicking the following link. While you’re here, why not check out the rest of our regularly updated blog here – there may be another soccer trip or tournament which piques your interest.